Alaska is a fabulous vacation destination. Snow-capped mountains, unspoiled forests as far as the eye can see, and the purest air you can breathe.While there are many outdoor activities to pursue, my all-time favorite is an authentic Alaskan tradition and the state sport, a dog mushing excursion. Known as "The Last Great Race on Earth,” the Iditarod is a 1,150-mile dog sled race held each March from Anchorage to Nome. The Iditarod Trail, now a National Historic Trail, began as a mail and supply route. Mail was delivered and gold was brought out via dog sleds over the roughest terrain from Seward to Nome. You can get a taste of the Iditarod by meeting mushers and champions, hearing about their personal experiences, learning how they train their Alaskan huskies, visiting the kennels, and participating in a training run with a professional team of sled dogs. The highlight of any musher experience is meeting and holding the adorable husky puppies. Tours are available in summer and winter, primarily in Seward, Juneau, Skagway, Fairbanks, Denali, and Anchorage. Most Alaska cruises offer musher experiences in their excursion offerings, but you don’t have to take a cruise to enjoy a tour. All types of tours are available at diverse price points; you can visit an Iditarod champion’s homestead for $59, take a helicopter ride to a dog camp and sit in a dog sled basket, or drive a team yourself for $519. I visited Jeff King’s homestead at Goose Lake Kennel and fell in love. As I exited the van someone handed me a husky puppy. The pups, all different colors, were sweet balls of fluff and delightful to hold. The visitors passed them around and we took photos. We learned from Jeff, who holds four championship titles for the Iditarod Trail Sled Dog Race from 1993, 1996, 1998, and 2006, how the pups were birthed, bred, and raised. Jeff also explained the history of the Iditarod and how he personally works it. This Husky Homestead Tour, offered mid-May to mid-September from Denali, is $59 for adults and $39 for children 12 and under (not recommended for children under 3 years of age). 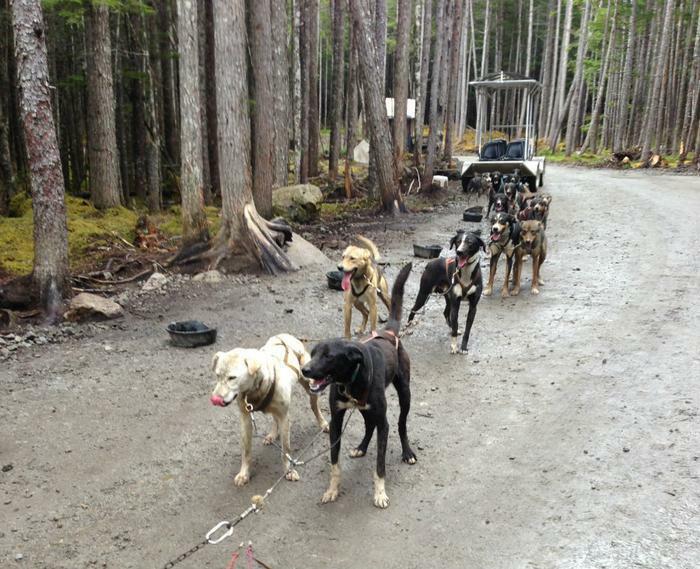 The Skagway Sled Dog and Musher’s Camp excursion I took was a more hands-on experience. On this tour we were picked up in Skagway and our driver shared a wealth of information on the 11-mile drive to the camp in Dyea. The tour began with a ride through the Tsongas National Rainforest that took us up about 800 feet to reach the husky teams. Three of us participated in a one-mile training run with a musher and his team of huskies on a wheeled sled through the rainforest. Our musher shared his experience and we got to meet and pet the dogs. We were taken back to the main camp and we did get to hold the husky puppies. They were precious, but this camp did not have as many puppies, and as we needed to share, our puppy time was limited. This dogsled tour, offered May to September from Skagway, is $135 for adults and $99 for children. There are even more expansive and expensive musher experiences. Just search online for “Alaskan musher tours.” Whether or not you like dogs, this is a not to be missed Alaskan experience.